1. The influence of my parents and grandparents. 2. The leadership of President Ronald Reagan which restored American exceptionalism. The Conscience of a Conservative was written by Barry Goldwater in 1961. I didn’t read it until I was a high school student and later read it as an adult. It left a profound mark on me and continues to wield a mighty influence. 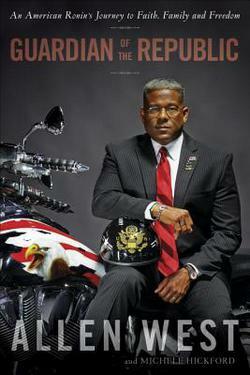 But a new book by former U.S Representative Allen West could easily serve as the new barometer for Conservatives. Indeed, it could easily be considered The Conscience of a Conservative for the 21st century. Guardian of the Republic is Congressman West’s plea to restore the vision of the founding fathers. It is his earnest appeal to return to the ideological roots that make America great. Part one explores the background of Congressman West, a Lt. Colonel in the military who was raised in Atlanta and influenced by his parents which shaped him into the man he is today. Part two is a primer on a conservative ideology which stands in the tradition of President Ronald Reagan. The author includes the basic philosophical and historical framework which undergirds a strong conservative stance. Among these principles include limited government, fiscal responsibility, a free market, individualism, a strong national defense, and an understanding that all of man’s freedoms come ultimately from God. West includes three “pillars of conservative thought” which include effective and efficient conservative government, peace through strength, and traditional American values. None of these are new ideas. But the reframing of these conservative principles is a welcome reminder which should call America back to her founding principles. Part three may be the most interesting section. The author calls black Americans to return to their roots – for they “fail to understand the soul of [their] souls.” West reminds readers the reason for the establishment of the Republican Party: “the abolition of slavery through the passage of the Thirteenth Amendment.” Yet many social programs only create dependency on the government and enslave people in the final analysis. What’s the bottom line? West argues that these programs are tantamount to a “twenty-first-century economic plantation.” Slavery ended long ago, yet a new brand of slavery continues – a kind of slavery that needs to be abolished once again. Do we want an opportunity society or a dependency society? Do we prioritize preeminence of the individual, or dominance of the state? Will we choose individual exceptionalism or collective relativism? Do we value wealth creation and expansion, or wealth redistribution? Will we bet on economic freedom or economic enslavement? Do we stand for principle or for party? Do we want policy or politics? While Congressman West has been caricatured as an “outcast” by some and a “war criminal” by others, nothing could be further from the truth. He has been falsely maligned and his character has been unjustly impugned – all in keeping with Saul Alinsky’s horrible diatribe, Rules For Radicals. Allen West is a breath of fresh air in a day when political expediency and opinion polls appear to rule the floor of Congress and the White House. Congressman West is a man who says what he means and means what he says. He is unmoved by the banter of political pundits. And he refuses to be intimidated by the progressive agenda which is steeped in the ruinous ideology of socialism. Allen West has led by example. He has served our nation well. He has guarded the Republic with honor, courage, and dignity. Perhaps he can wield his influence in the Oval Office one day. America would be a better place with this principled man behind the most powerful desk in the world.